Sometimes, you look at a bit of ultra modern technology and can already see people in ten years' time laughing at it. My old Creative Zen MP3 player was a bit like that. Lovely bit of kit to listen to but a house brick even when it came out, it became embarassing fairly rapidly. Remember the original Walkman? 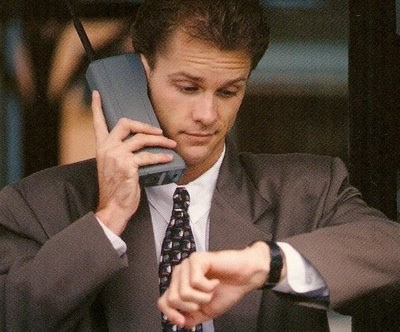 OK, that one's a bit of a design icon, but 80s mobile phones? See also any other ridiculously small gadget / MP3 player. We'll laugh that we thought they were small and we'll laugh that you actually had a separate gadget especially for music. You don't have to put a key in the dash, but you've got to have it in your pocket, so you've still got to remember to carry the thing. Seriously, if your car doesn't just recognise you, unlock the door, move the seat to your setting and cue up a custom playlist on the stereo, what's the point? Crap at photos, crap at video, good at playing scrabble. Why did we spend so much time with this again? I keep banging on that Facebook's going to have a serious problem soon. When somebody connects people as effectively but gives them a better platform to do things (or connects different platforms) it's all over. UK radio will be digital only by 2015. Except it won't. By 2015, we'll either be at or very close to a scenario where radio can be streamed easily via next (next) gen 3G mobile or wireless. When that happens, what's the point in digital radio? Spotify is already there, the technology works. Remember when movies came on disks and you had a whole shelf full? Hilarious! Compared to a download to whatever is plugged into your TV in a few years' time, Blu-ray is fragile, cumbersome and expensive. Netbooks belong on this list too, but it's a top 5. Got any more?